In these parts, there's a lot of newer brick inside of homes that isn't as beautiful the brick in the pics above. Has anyone had any experience "aging" brick and/or giving it some character? I've seen examples of some pretty painted bricks but would love to know about simplyadding some "patina" to newer bricks. I had a client whose walls we needed to add some patina to and my Faux finisher Kelly Walker of Baltimore artstar accomplished that for me beautifully! I just love these pictures. We installed a wood stove on a brick hearth about 5-7 years ago. We used real brick that was cut down and applied to the floor. I was thinking that would be a great product to use on the walls. It looks old, but is thin enough to slap right on the wall. I need to climb in the attic and find the leftovers up there to do more research on the product. I'd love to do an accent wall with it. my bedroom at my lake house has a wall of exposed brick. I've been tempted to paint it white as we are redecorating w/ gray and yellow. What do you think, it's too hard to go back if I paint it. I wonder how I could tell if our new 1914 home has any brick on it? Probably not old enough... I do so love that look! 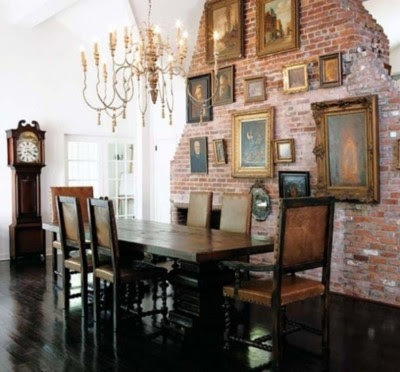 I would die to have an exposed brick wall. Unfortunately in my apartment it would just be an exposed bunch if studs and wires. Thanks for the drool worthy images! I love your blog. You may want to check into sandblasting it to age the brick. The seal that is on your clients brick (in my opinion) doesn't give the character that you are looking for. I think having some cement spread over it here and there to age it would look super cool too! 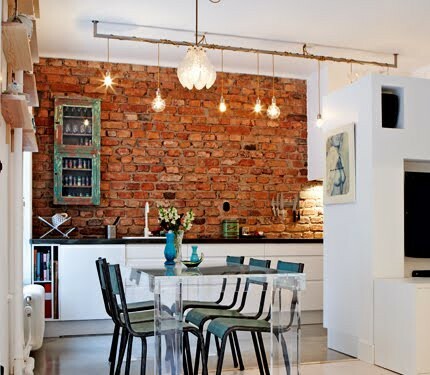 I love the brick in Marla's kitchen! Here is the link-http://leftonamelia.com/. The first pic of "good brick" is sooo pretty! It's even better when the bricks are different sizes and not uniform. oooh, so true. I also love a good exposed brick wall in a bar. makes it feel SO much more cozy and less sinful! We had a bad brick fireplace (not like the good walls you showed here) and we "limed" it with drywall compound, slathering it on, letting it dry, and sanding it with a belt sander. We didn't take too much of it off, but I'm guessing you could keep sanding until you got the level of white+brick that you wanted. We got the idea from a store in NYC, so it can definitely be done on walls too. Here's a link to some photos. Need to take some closer-up shots. When building homes we used a lot of reclaimed brick....from very old buildings.....gives a great look. Some clients even painted the used/reclaimed brick. If we ever used a newer brick we would do a sacked or broomed finish, leaving mortar on the face of the bricks. I have a brick fireplace from the 70s and they are too reddish to my taste. I'm thinking about whitewashing the bricks, instead of painting them, hoping to give it a different look and texture. All these pictures are so pretty - thanks for sharing! 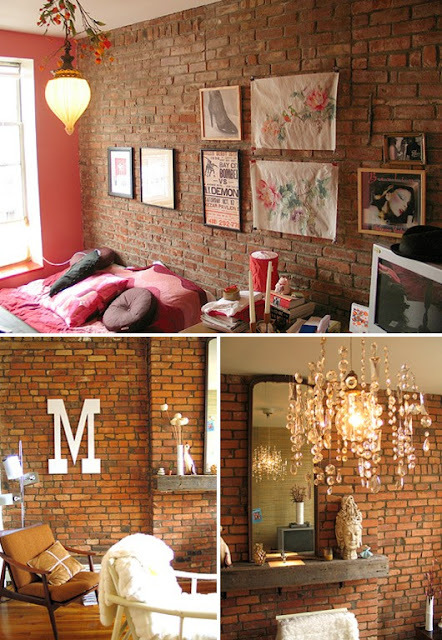 I've never had an exposed brick wall, but I did have a brick floor installed in an extension to my home some years back. I saw it in an old house years ago and always promised myself I'd one day have a brick floor. I absolutely loved it. This is simply gorgeous. It is different from others. I agree it looks cool -but it is a bit 'cold' for a house I think. Plus - 1st hand experience. My office is in a 200 yr old flour mill with exposed brick walls. The brick basically slowly crumbles all day long leaving grout and brick bits on my desk. Plus as there is tnohing else but 24" of brick between me and the outside - bugs (ants especially) find their way through the brick and onto my desk! EW! 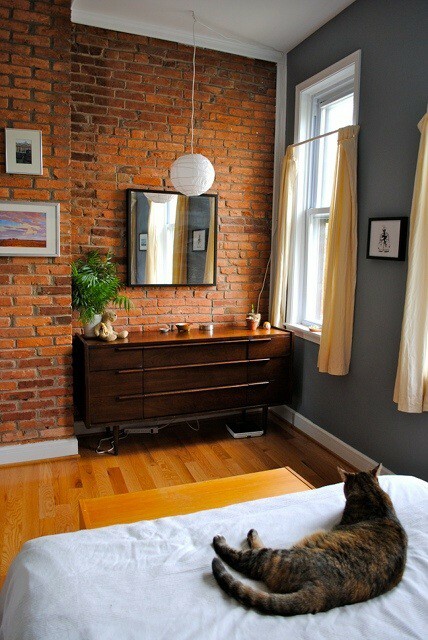 Lauren- I've never been so lucky to have a old, exposed brick wall. Thnak you for sharing those images! I love burnt brick. We have a bunch of 1920's homes in our neighborhood where a mason used "reject" brick on the exterior - burnt and mishapen. What an amazing look! I love those walls. They just add so much character. We don't live there anymore but I loved having that touch of brick in the kitchen. 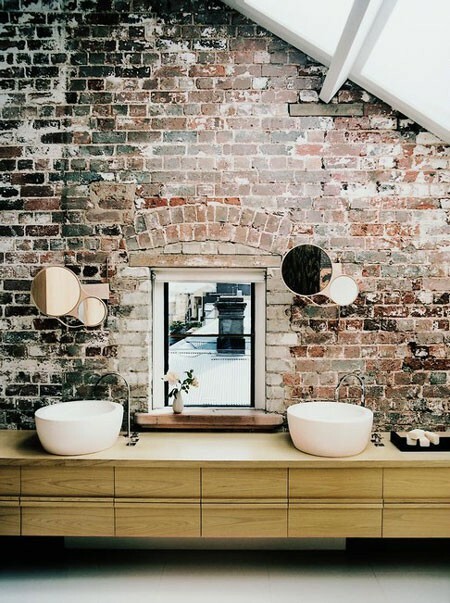 I love this exposed brick walls so much. You allot fantastic image of this beautiful wall. Its look very lovely and pretty. Hi Lauren, I just love your blog and natural, happy style! I recently whitewashed some brick with interior paint and a bit of grout. It was super easy and added that little bit of patina I was yearning for. Footnote: My son has a two-floor unit condo that dates back to 1912 with original (re-conditioned) plank h/w floors, decorative tin ceilings and has an EXPOSED BRICK living room WALL. The latter of which is my favourite feature! The building itself has been everything from a City Hall (the storage lockers once were jail cells),a Catholic Convent and also a Private School.